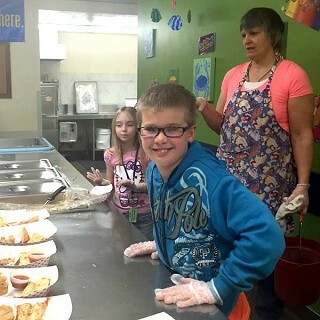 Every day students at all three Sisters public schools have the opportunity for a nutritious breakfast and lunch served by smiling nutrition workers. For as low as $1.50 per student for breakfast and $2.50 to $3.25 per student for lunch, students receive well-balanced meals. The Healthy and Hunger Free Kids Act of 2010, driven by the USDA, changed the guidelines for what the nutrition services staff can prepare at each of theschool sites. Even with the new guidelines, the nutrition staff in the Sisters School District do their best to make each meal their own. Lunch menus include items like a barbecue pork rib sandwich, chicken tacos, spaghetti and breadsticks, and bean and cheese burritos. Meals come with fruit like an apple or applesauce and a vegetable. All three schools always have their fresh salad bar available as well. There are no bagged salads in any of the cafeterias in the district. Each school cuts and prepares greens for the salad bar every day. In the spring all threeschools are connected with local growers for their lettuce and other greens. Seed to Table coordinator Audry Tehan has been providing some produce forSisters Elementary School and soon the greenhouse at SistersHigh School will allow for students to enjoy food that many of their classmates have grown. “We do our best to make everything from scratch, we don’t use frozen burritos – they are hand-rolled. On Tuesdays I prepare the meals for all threeschools at the high school,” says Terri Rood, operations assistant for the nutrition services department. “Something like spaghetti is made in the high school kitchen and packaged and delivered to each of the schools to be served. Rood has an office at Sisters High School and has been employed by the Sisters School District for the last 16 years. She is the only full-time employee in the nutrition department. The additional five employees work limited hours ensuring meals are prepped and ready to go for students. “It’s challenging every day to make it happen,” she says. “I love connecting foods to kids at every school. Even though the nutrition workers provide healthy, nutritious meals using fresh ingredients as available, lunch numbers are still low, especially at the high school with around 40 students per day eating from theschool cafeteria. Around 100 students per day eat at the elementary school and just under 100 per day at the middleschool. Breakfast numbers are lower with an average of 40 at the elementary school, and between 20-30 at the other two schools. The low numbers at SHS can be attributed to a variety of factors. Some students leave campus for lunch. Staff in the nutrition department believe there is a stigma around eating hot lunch in the older grades. Some students use their lunchtime for socializing; some don’t want to be seen as the student who eats hot lunch; and there are some who may not be aware of the choices that are available. There are suggestion boxes at all three schools for students to submit ideas for new and different menu items. Students can also share what they like and don’t like on the menu. The more constructive the comments, the better it helps the staff to improve. While lunch numbers are lower in the higher grades, the elementary school has seen an increase of about 20 students purchasing food at the cafeteria since November, when Angelena Bosco started full time. She believes that is due to the positive attitude in the kitchen. There is a common theme throughout all three kitchens in the district – positive energy. Angelena Bosco loves working with the kids at the elementary school. Cafeteria staff even set up a program that allows for two or three students from third and fourth grade to come in and help at lunchtime. Students that participate choose to miss their lunch recess to volunteer in the kitchen and they are having so much fun they keep coming back. “They love to serve during the lunches because they get to see their friends,” says Bosco. At the high school, Rood loves to share new food with the students. As spring comes around Rood is especially looking forward to using her living wall in the cafeteria. A contribution from the Sisters Science Club a few years back, the living wall allows her to grow herbs, edible flowers, tomatoes and more right in the cafeteria.